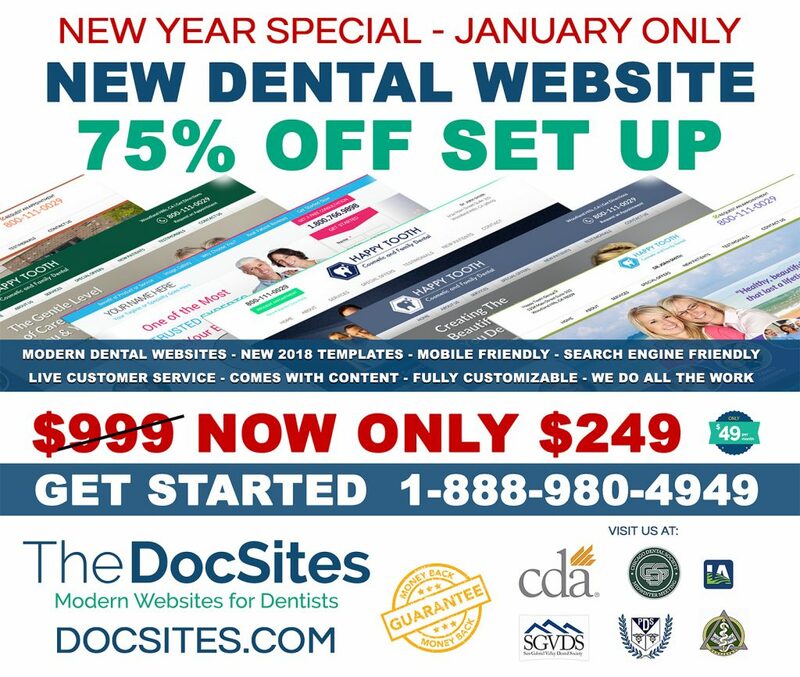 In this last month, DocSites has re-launched the websites for two dental practices in California. Unless you have one foot out the door and are ready to retire in the next 6 months, it’s vital to remember that your website can be your #1 source for generating new patient appointments every single month. Don’t let another month go by before you make a much needed change…. Call us directly at 888-980-4949 to speak with a dental website expert today! Our goal is to provide the best customer experience for dentists and doctors looking to have a great website for their practice. Go on our website to select one of 36 mobile-friendly options. Not sure which is best for you? Call us and we’ll help you pick one best suited for your practice. Complete our easy online form where you submit your bio, any images you’d like on your new website and basics such as office hours, contact information and services you offer. Don’t have time for that? Simply call us and we’ll complete the form for you – you don’t even have to be in front of computer. 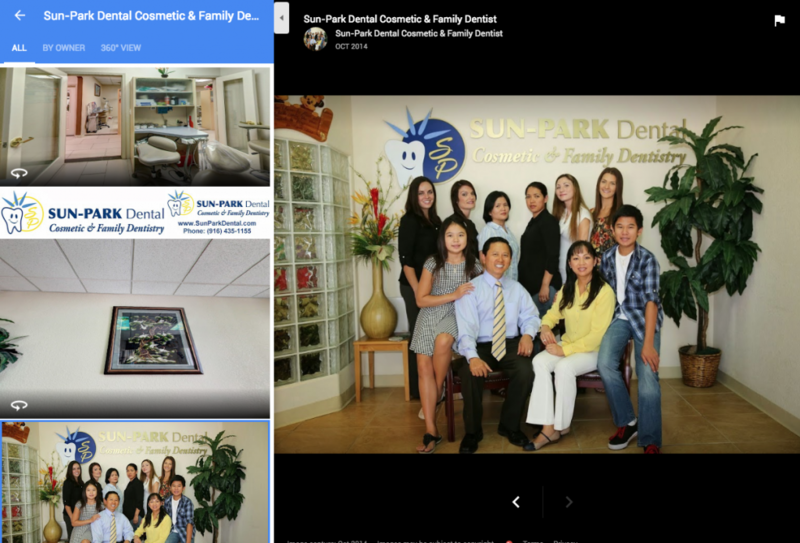 We addd images, your bio, embed your great testimonials from Yelp, Google and other places and essentially personalize the website for your practice. 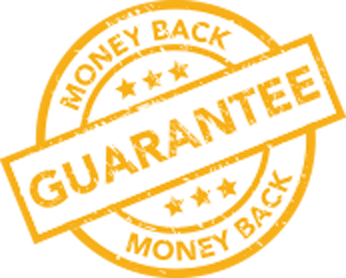 We send you a private link to your new website, after we’ve done a full quality inspection to make sure it’s exactly to your liking….and upon your approval we launch your new website. What about my website domain? Dont’ have a domain? That’s okay, we’ll buy one for you. And with DocSites YOU will always own your domain even if you cancel your website with us. What’s the monthly charge and what do I get? After we launch your new website, you only pay $49 per month – this includes hosting, back ups, security, maintenance, and any updates you want (which we will take care of for you). Contact one for our friendly web experts today. What makes for a great dental website? 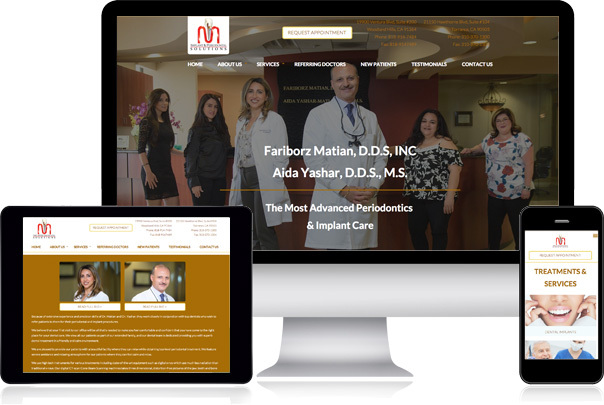 Checkout this dental website design review from Southern California dentist and practice owner Fariborz Matian, DDS. 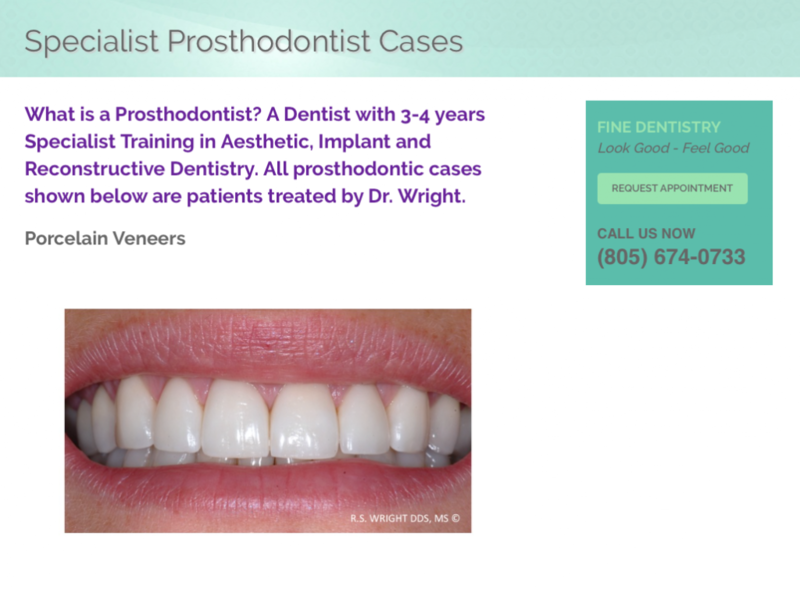 Local dentist shares his reviews of DocSites for his dental website design & development. 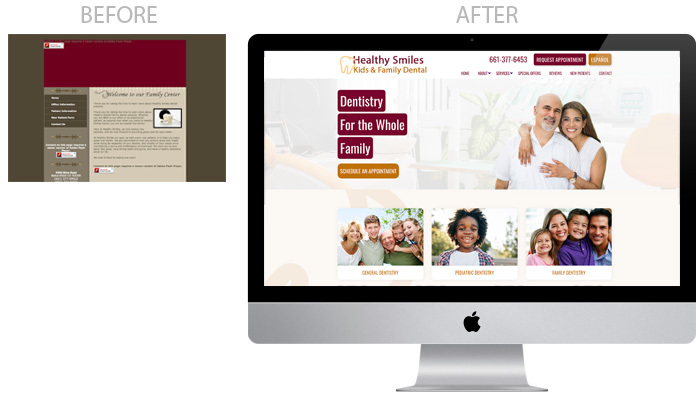 Why Choose DocSites for your Dental Website Design? -No Work from you! We do all the photoshop and setup. 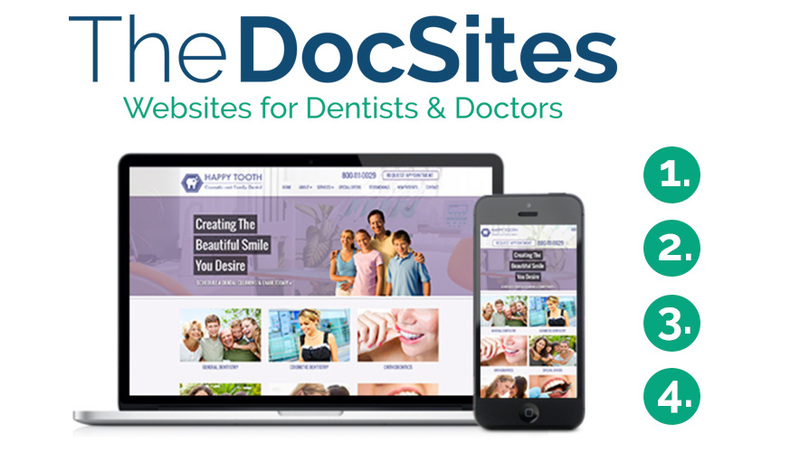 TheDocSites – the best website development company for dentists, and best marketing company for dentists – will be exhibiting at the Chicago Mid-Winter Meeting in 2018. If so, come meet me at booth #743, we are offering an expo only Free website setup. That’s $0 to get started. Or just come pick our brain about enhancing your website, internet marketing and social media marketing. Not able to make it and still want the $0 Special Offer? Call us at 888-980-4949 and we’ll offer the same special for the first 3 dentists who call. 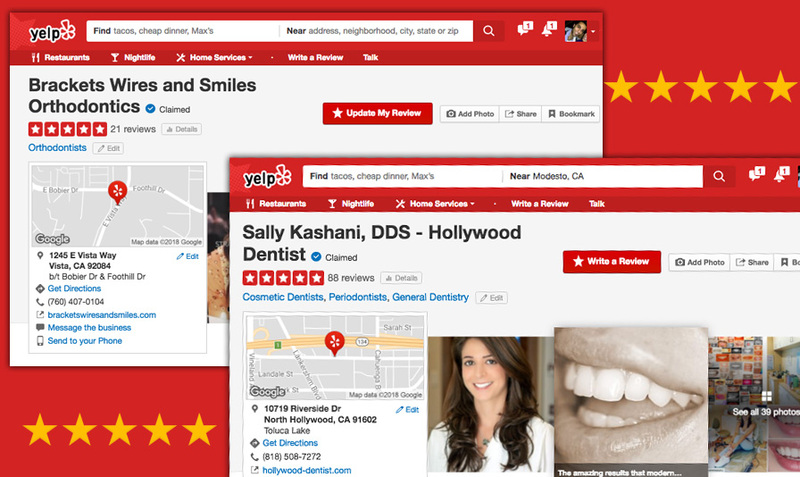 At the time of this writing Yelp is the #1 Reviews site for dentists and physicians. 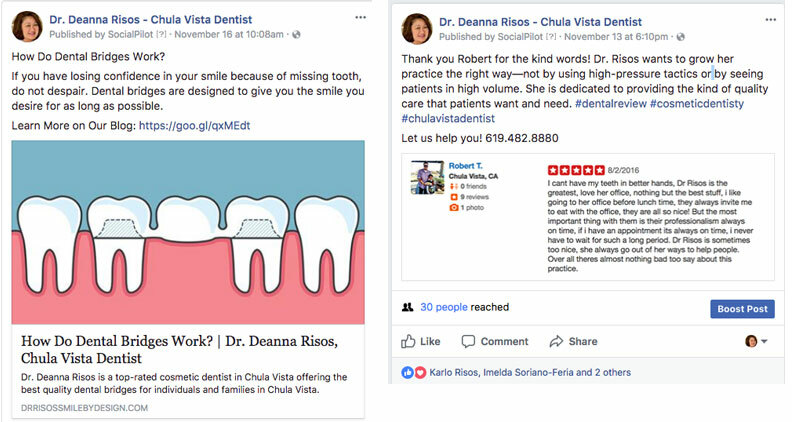 Many dentists, physicians and their office staff work hard to provide great customer service – which in turn generates great customer reviews on Yelp. This in turn leads to more patients booking more appointments. Even with great 5-star reviews, most doctors still miss these two big opportunities to leverage Yelp for even greater marketing success. Here are two simple ways you can get MORE out of your current 5-star reviews. 88% of people trust online reviews as much as friends. In order to build trust with prospective patients, make sure you showcase your 5-star reviews on your website. This is a very easy tactic, that often gets overlooked! Many patients (prospective & current) will check out your social media – Facebook, Instagram, Google, etc. – before booking an appointment. They are looking for confidence in their decision to come to your practice. Strengthen their confidence by showcasing what other patents have to say. Make sure you or your marketing company is staying on top of the best practices. Do you think just having a “claimed” Yelp profile is all you need for yourself and your practice? Think again! 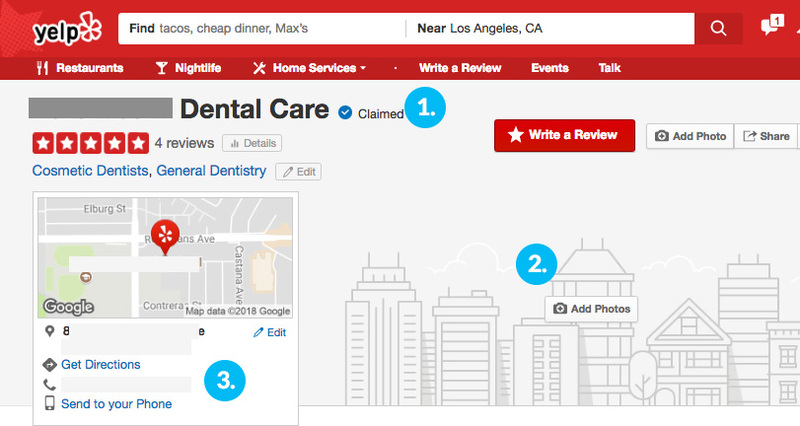 Dentists, your drawbacks on Yelp might be keeping you from many potential new patients. With 9+ years of dental marketing experience and working with over 250+ practices around the nation here is what we’ve learned. Dental practices of all sizes and types need to avoid these mistakes we commonly see in our 9+ years of working with over 250 dental practices. If your Yelp profile does not include your name – ie. 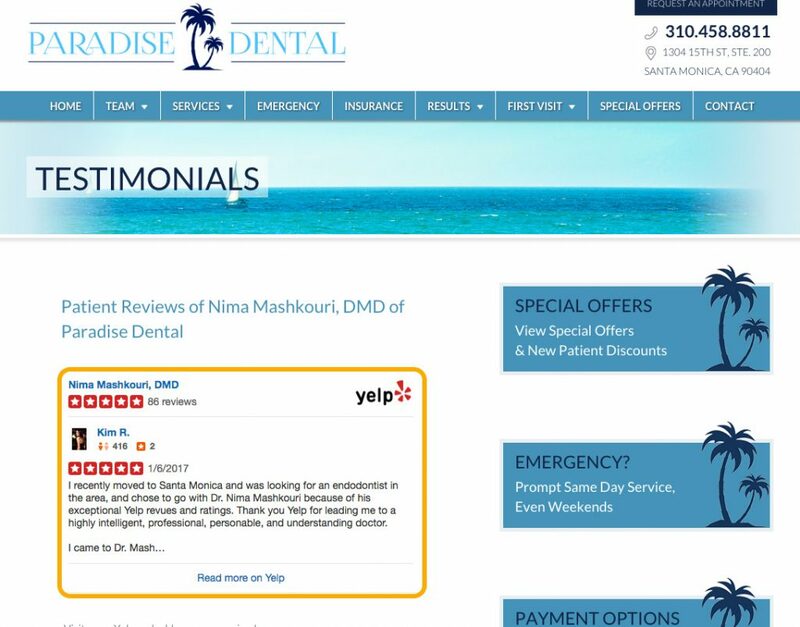 “John Smith, DDS” then your Yelp profile doesn’t show up when people Google your name! This is vital because almost everyone who is thinking about becoming your patient will Google your name, even if they’ve been referred to you. Over 80% of the information our brains process is visual. If you’re missing photos, you are robbing yourself of the opportunity to show people what makes your practice unique. Yelp provides an area for you to place your website address so people can easily access it. Your website gives you the opportunity to share a lot more information about yourself / your practice that YOU control. Make sure people can get to it quickly, after they’ve read your great reviews. If you have a website, make sure the link is placed in your profile. If you don’t have a website – why not?! If you are a dentist or practice owner thinking about hiring someone to do your social media marketing, this post is for you! Dentists and orthodontists should work with marketing companies who understand the dental industry. Great social media marketing is a combination of showcasing what makes your practice unique along with content that patients would find valuable. What makes for good dental social media marketing? Establishing Your Brand Online – When people are Googling your name or practice, what is showing up? More and more these include social media profiles – ie. Your Company Facebook page, or your Google My Business listing. Make sure you have profiles with quality photos & descriptions to tell people what makes your practice unique. Posting Valuable Info – Instead of justing posting about funny tooth jokes, it’s beneficial to post content that your patients find valuable. 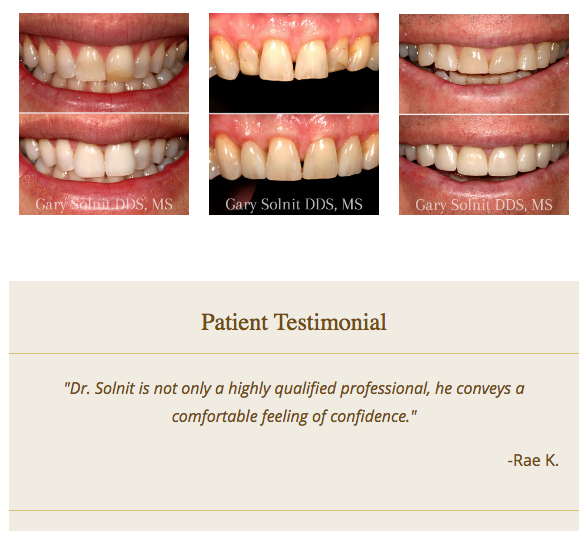 This can include “Before / Afters” or even highlight Patient Testimonials. These types of social media posts will help establish trust with new prospective patients, and even your current patients. Promoting Special Offers – Social media is a great way to promote your special offers. Nowadays many new patients will check you out on Facebook or Instagram in addition to your website. Make sure you have any special offers in your social media profiles. Why Choose TheDocSites for your dental social media marketing? At TheDocSites, we have 9+ years of experience helping practice owners make the most out of their social media. Looking for social media marketing for your dental practice? Call us today at 888.980.4949 to get started today. 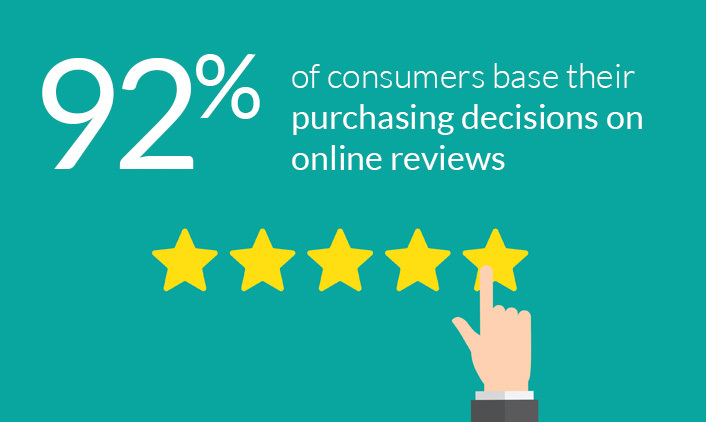 Studies recently reported that almost 92 percent of patients base their doctor choice on online reviews. The increasingly savvy patients are relying on social media platforms and third-party review sites, such as Facebook, Yelp, and Google+ to read reviews, parse out provider information, and get updates on the latest trends in order to make more informed choices when selecting a provider. More than ever before, dental and medical practices have to make managing their online reputation a priority so that their practice portrays a positive image to their community. This will, in turn, ensure the loyalty of your existing patients, and help you achieve your long-term business goals. Social media is one of the most powerful digital marketing tools available today. With over 1.8 billion active members (and growing) in the different social media networks – Facebook, Twitter, Pinterest, etc. – having an active presence on multiple platforms can increase your reach within your community considerably. Many patients that choose our client’s offices have noted that they consider online opinions as if they were personal recommendations from a close friend or family member. This means that positive online reviews by your satisfied patients can easily reach other prospects beyond their circle of family and friends on social media. For instance, someone searching for your services in your area can come across your positive review and be influenced to try your practice. Positive online reviews not only give prospects a reason to choose you, it will also give Google and other search engines a reason to give your practice precedence. 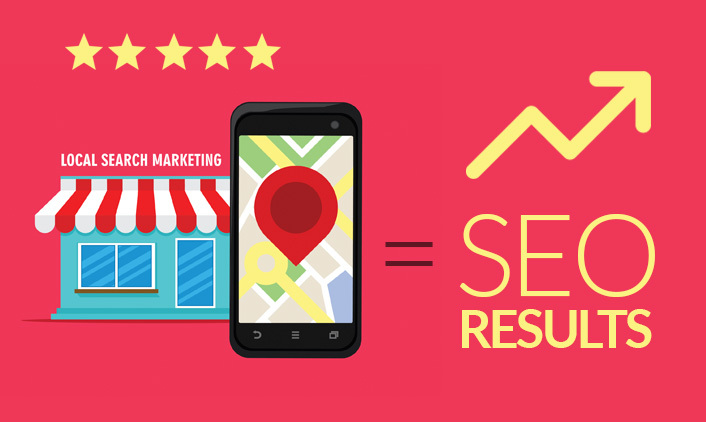 Since search engines are in the business of giving searchers the most relevant results based on the search query, they love online reviews too. In fact, online reviews account for nearly 10 percent of search engines’ ranking factors. Check back in to see the tips on how to get great reviews for your dental or medical practice. As all doctors and dentists know – building trust is the name of the game for getting new patients. 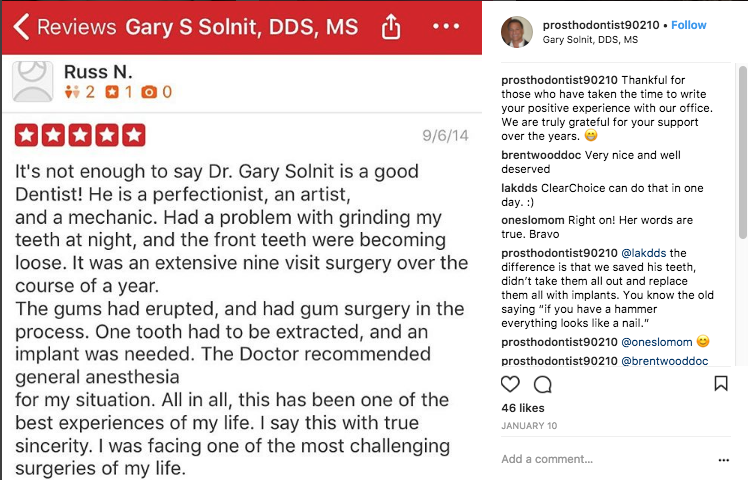 We’ve found that one of the most effective strategies in medical and dental marketing is showcasing your patient’s before & afters, as well as highlighting specific positive reviews you have received for each treatment. 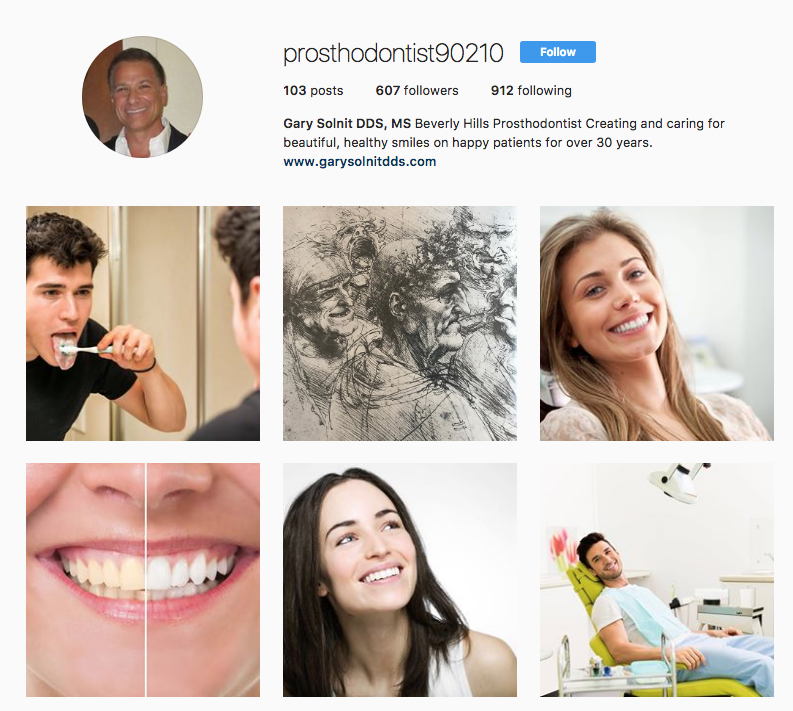 For example, if you’re looking for more cosmetic dental patients then documenting and publishing your before & afters will be the most successful information you will post. The reason is that patients and people buy solutions to problems/issues that they have. Essentially you are telling a story of successful transformations by highlighting the before photo (the problem) and then the after photo (the solution). As a healthcare provider, you are creating confidence with the patient that you are able to fix their problems. People come to your website because of personal fixes that they are looking for…they are conducting visual research to see how you can help them. Seeing beautiful results will motivate patients to take the step in engaging your practice for a cosmetic procedure. As the saying goes, the proof is in the pudding – our best performing dental clients take the best photos of their procedures. From there they deliver it to our team and we work on the design, optimization for search engines and review websites. Those are the clients that end up getting patient appointments for high ticket cases. 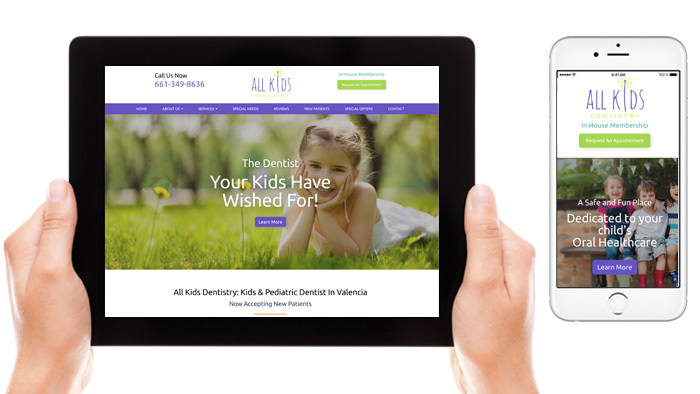 Our team can guide you with all of your needs, strategizing and building a successful dental and medical websites. The #1 thing you need to keep in mind is that patients don’t just want to hear your office is great – they want to see the high quality work you’ve actually done!